In memory of Terry Liddle, a member of the Commune who died recently, we republish his short summary on the Spanish Revolution. In 1931 the Spanish King Alfonso XIII, having supported the discredited dictator Primo de Rivera, went into exile. The Second Republic was proclaimed. Articles 26 and 27 of its new constitution placed stringent controls on church property. Members of religious orders were banned from the ranks of teachers. It also allowed divorce, gave women the vote and stripped the nobility of its special legal status. It established a legal procedure for the nationalisation of public services, banks and railways. In 1934 Catalonia attempted to establish its autonomy with the Spanish Federation. This moved was suppressed and Catalonia only became autonomous in 1936. Its government was called the Generalitat. Happy economies are all alike; every unhappy economy is unhappy in its own way. The well-worn acronym PIIGS (Portugal, Ireland, Italy, Greece and Spain) conceals more than it reveals. The PIIGS are not all alike. Consider the difference between Ireland and Italy. Pre-crisis Ireland had a debt/GDP ratio of 25%, one of the lowest in Europe. Today it’s over 100% and is projected to rise to over 120%. Ireland’s crisis is not due to an over-expanded public sector, unsustainable spending, persistent budget deficits or anything like that. It is due to the bubble in the property market and the ongoing mismanagement, largely at the European level, of its collapse . 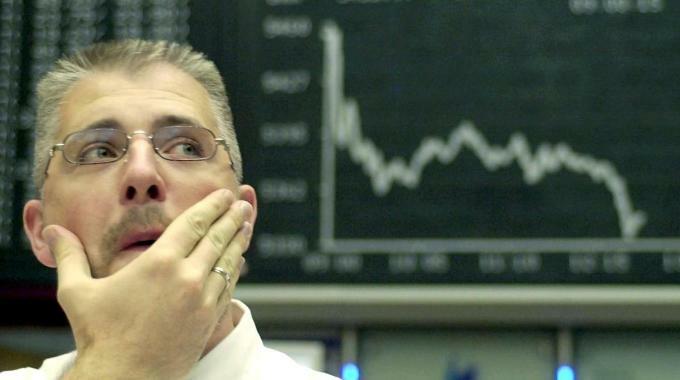 Over the last four years Ireland’s economy has been wrecked by the crisis. In contrast Italy has had major problems for sometime. Italy’s debt, which has already reached 120% of GDP, does not reflect the kind of rapid shift that has happened in Ireland. Rather Italy has had a long run budget problem. Italy’s debt has not been below 100% of GDP since the early 90s. Italy’s debt problem cannot be blamed exclusively on the crisis in the same that Ireland’s can. The recent boom in the Spanish economy was based on a real estate bubble and most new jobs were in construction and bars and restaurants. Ahead of Spain’s 29th September general strike, Millie Wild spoke to a Madrid Metro worker about the recent movement against 5% pay cuts. The Madrid metro went on strike this summer in defiance of the anti-strike laws of “minimum services”, up against a massive media hysteria campaign and a virulent legal attack by the employers. The wage cut is not only an austerity measure but an attempt to weaken the entire collective bargaining process. 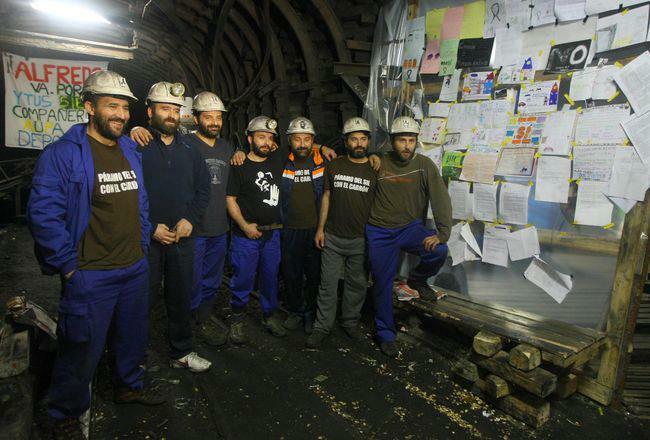 The Metro strike was important for the strike methods, the open strike assembly, the militancy of new workers, and the solidarity shown by others, so we interviewed one of the metro train drivers, from the union Solidaridad Obrera. In the spring the government, as part of the austerity plan, moved to cut public sector workers´ wages by an average of five per cent. We had previously signed a “convenio”, an agreement, which was for four years. These convenios have never been broken before. 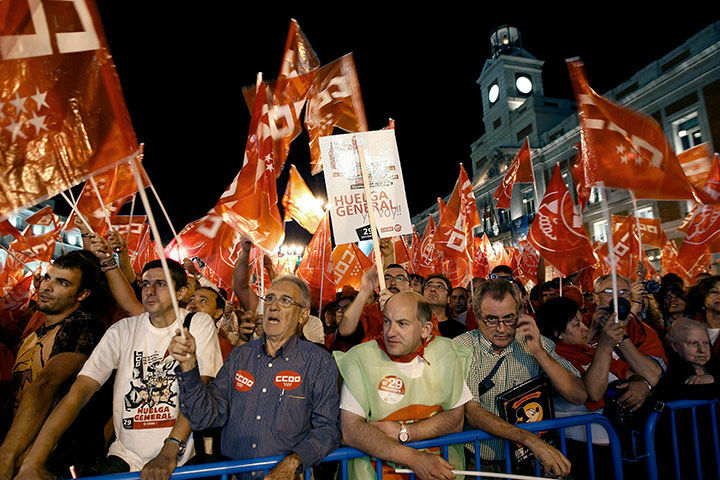 The metro workers were not originally part of this austerity measure but the right wing regional president of Madrid included the metro and other semi-public workers such as the water company in the pay cut. The workforce consists of 7700 workers, drivers, maintenance workers and station staff, half of whom are young workers who started in the last few years. In the first general assembly there were about 5000 people. There were delegates in solidarity from the Madrid bus drivers. Some workers had brought their partners and kids. We had to take away all the chairs as there was no room. The heat was unbearable, people were standing in the corridors. The proposal was made to have a one day strike with minimum services, (ie. fifty per cent of trains would run) and then if the regional parliament approved the plan to reduce wages then there would be two day strikes without minimum services. (tr. minimum services are an obligatory level of services which are imposed on strikers in certain important services and which mean that strikes don´t ´cause too much disruption´.) The assembly voted 100% in favour of the all-out strike (with two abstensions!) There had not been a 24 hour strike without minimum services in the metro since 1987. On 28th June, the first day of the strike, with servicios minimos, the regional parliament approved the wage cut and so the next day the workers moved to an all out strike. People started picketing from 3am. Not one single train left the depot, the strike was a 100% success. Thousands of pamphlets were distributed at stations asking for solidarity with the strike. At one picket line, there were 15 bus company workers on the picket line in solidarity, and forty squatters from Madrid´s social centres movement. The strikers were amazed at this level of support from outside the Metro, and the mass pickets had a really big impact on morale. The company opened disciplinary proceedings against one thousand two hundred workers for not carrying out the servicios minimos. The company then said that they were going to open the line from the airport to the centre of Madrid. A massive contingent of police went to the start of the line. The company pressured drivers on temporary contracts, telling them their contracts would not be renewed unless they drove these trains. The TV were announcing live on the news that the line was going to open. The strikers reinforced the picket lines and convinced the drivers not to open the line and not one driver took out a single train. Again the strike was very successful but the media were attacking the strikers with all guns blazing, strikers were on the defensive, there was a mass denunciation of the strike. At the general assembly, two of the unions in the strike committee didn´t want to continue the strike. In the end the strike continued for the next two days but with servicios minimos. At this point the company contacted the strike committee and said they wanted to start negotiations, but their condition for negotiations was for the strike action to stop forthwith. Four out of the five unions in the strike committee were in favour of calling off strike action. Solidaridad Obrera wasn´t, they said they wouldn´t change their position unless the general assembly asked them directly. And in the assembly they said that they weren´t in favour of calling off the strike. However in the assembly there wasn´t a general will to continue with the strike owing to the attacks by the media and a general fatigue, and the assembly voted to stop the strike and open negotiations. The company were intransigent that there could be no agreement without a pay cut. Four of the five unions agreed to this. At this point Solidaridad Obrera said that they were not prepared to accept the agreement, and so two proposals were put to the general assembly. Seventy per cent of the assembly accepted the proposal but a large minority of thirty per cent voted against it. Many people who voted to accept it said that they did so out of fear and weren´t happy about the settlement. The mainstream unions said that the 1200 disciplinary proceedings would not come to anything, it was just to placate public opinion, but if the strike action continued, well, they couldn´t guarantee anything. They then turned around and signed an agreement which, for the first time, accepted that the disciplinary proceedings could go ahead after the strike finished! In August the regional government started legal proceedings against all five unions, and the members of the strike committee personally, claiming compensation of six and a half million Euro for damages. Metro management is also continuing with the disciplinary proceedings against drivers. The unions have opened counter-proceedings, and an agreement has been made to call an emergency general assembly the moment any worker is sanctioned in these disciplinary proceedings. The real importance of this strike has been how it was carried out. The participation of young workers, with no experience of strike action, was excellent. This strike has broken out in the context of an austerity campaign in which the government wants to impoverish the working class in order to pay back the debts they have taken on from the banks. To do this they want to attack the whole collective bargaining process. These types of disciplinary actions are not usually followed through after the strike has finished, normally they are shelved. This and the claim for damages against the union shows that the workers are now being attacked for the stand they have taken and we need a strong and united campaign of action to defend them.